My son is now two years old and will most likely grow two-shoe-sizes bigger before the year ends. I really have half the mind of buying shoes that are a few inches bigger so they can last longer or perhaps buy cheaper shoes since he’d be wearing them for only a few months. But then, I am reminded that during the toddler years, bones in the feet are still developing. This is why choosing proper shoes for toddlers is very important and requires great care. I really wouldn’t want my Sean to have problems with his feet and legs when he grows up. In my search for great toddler footwear, I came across Tsukihoshi which is the largest manufacturer of children’s footwear in Japan. All Tsukihoshi footwear are products of years of research to perfect shoes for children. These are footwear that not only provide comfort and protection but also promote proper foot development. 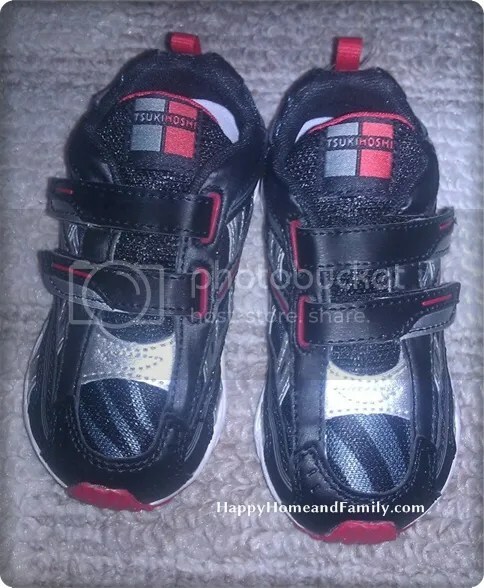 I thought they’d be perfect for my toddler so I got him a Tsukihoshi Child35 Flame Sneaker in Tiger/Red. The Flame-35, like all Tsukihoshi footwear, is machine washable, anti-bacterial and ultra-lightweight. It’s made with synthetic leather and nylon mesh upper which means you can just throw it in the washing machine when it gets too soiled. The removable insoles are infused with Green Tea which is known for its anti-bacterial properties. Putting them on my active toddler is also made easy with double hook-and-loop closures. Velcro in shoes is really heavensent to moms of toddlers! This pair of Tsukihoshi also provides ample protection for my li’l one’s feet. It’s reinforced at the toe to guard against bumps and also has extra toe room for proper splaying. Moreover, it is also equipped with Flex Grooves and Firm Heel Counters. The sole is made of flexible rubber that provides good grip to prevent slips and falls even on slippery gym floors. Definitely, the Flame-35 is made for comfort and protection. The Tsukihoshi Flame-35 is available in 11 different designs for girls and boys. If you’re looking for toddler shoes that won’t hinder proper foot development, do check out the Tsukihoshi line of footwear. My son is loving his Flame-35 because he finds it all soft and comfortable. If they had it in adult sizes, I’d have gotten myself a pair in Floral/Silver. You can buy this Tsukihoshi CHILD35 Flame Sneaker (Toddler/Little Kid) at Amazon. Follow them on Facebook and Twitter to get their latest news and promos. Very nice shoes! Maybe we should snag some up! These shoes are fabulous! Baby Novalee will be needing a good pair of walking shoes soon. it is so important to have the right walking shoes for toddlers. Thanks for the post!